What are RLSs, Residential Life Scholars? Residential Life Scholars can support you settling into accommodation, with the chance to become one yourself. Residential life scholars are an in-house team of second year, third year and postgraduate students who live in student accommodation. Here at UEL, we have one Residential Life Scholar per hall and when you first move in you have the opportunity to get to know them. Their role is to offer support and advice about living on campus and information about accessing support across the university. As part of this role, the RLSs will provide events which give you the chance to meet students from across your hall and the University. The RLSs visit flats regularly, provide weekly drop-in sessions to give you information, support and details about social activities happening within residential life. RLSs can help resolve student queries, flatmate concerns, study issues, and much more. Their own experience and knowledge of being a student means that they appreciate all of the questions you may have about living within UEL accommodation, even something like how to use the washing machine in the laundry room. The RLSs can offer advice and guidance and they also deliver a variety of events from a group trip to IKEA through to a regular film night. 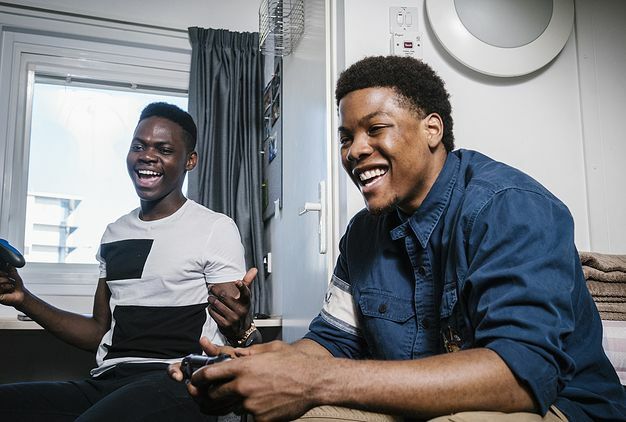 The role of the RLS through visiting, offering advice, events and a helping hand in meeting fellow students, will support an excellent student residential experience and a sense of belonging while living within UEL accommodation. Who knows you may wish to become a Residential Life Scholar yourself in the future. Becoming an RLS is a truly rewarding experience, and offers you the chance to be part of a unique community, enhance your employability and live in UEL accommodation at a vastly reduced rate. The main role of an RLS is to build rapport with a group of allocated residents through weekly visits throughout the year, but the RLS is also a point of support, a conflict mediator and an events coordinator, as well as a champion of inclusive communal living.